When Pac-Man meets Power Rangers, or Mommies who like to Write! It’s a beautiful morning in Southwest Florida, with a chill in the air and a hot mug of coffee steaming by my side. Between the sound of the dog aggressively cleaning her lady parts and the sound of my incredibly hyper five year old urging me to become the Penny to his Bolt, and then consume a Sensu bean so I can come back to life and battle the Great Sayaman before the Red Ranger comes to defeat us, through the lava (Obviously) . . . I am having somewhat of a hard time with my editing. Tell me, please, how other aspiring writers manage to work on their manuscripts while offspring play – loudly – and the real world spins right alongside the angst and drama of whatever imaginary world we are trying to create, because I think I’m missing something! 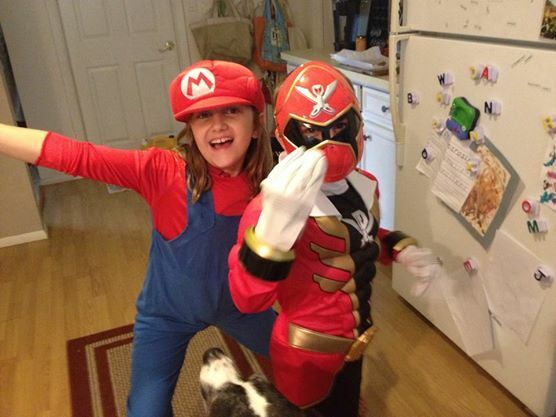 My youngest son Noah, pictured here as Red Ranger-channels-Morpheus, with his favorite cousin Lily. 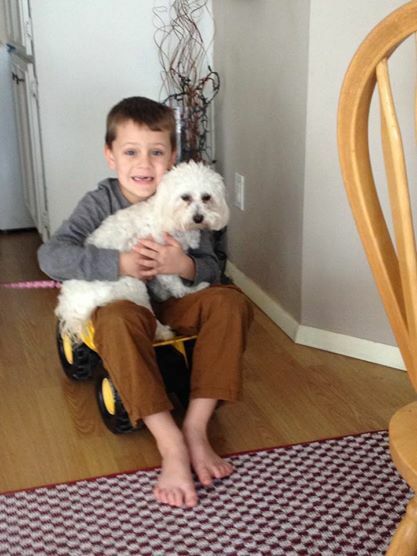 Mario/dog trainer extraordinaire. This is my life, 98% of the time. Suddenly, in the midst of my morning play – it hit me – clearly I’m approaching this all wrong! Instead of throwing myself into the adultiness of the current story I’m working on, perhaps I should collaborate with my littlest boy and take a page from his crazy-imaginative five year old book. Why not create a children’s book as well?! Little known fact: on top of being a stay at home mommy, a licensed Realtor, and an occassional wordstress, I am also a Montessori teacher 🙂 Montessori is an absolutely beautiful and holistic approach to learning, honoring the child’s natural curiosity and nurturing their independent nature. One of the most fulfilling aspects of working in this realm is the respect and understanding of the way a child’s mind develops scientifically, and the stages of psychological development and what each stage requires emotionally as well as intellectually. With any luck, this will serve me well in my quest! Teachers often become authors, so why not me? Now, lets see. Which direction should we take? A Pac-Man reboot? Power rangers fan-fiction? The sky’s the limit, as long as I play by Noah Benjamin’s rules. . .
King Noah, with a beleaguered Princess Lorelai! Previous Post Italian Wedding Soup ~ Because when it’s cold and gray, you EAT!